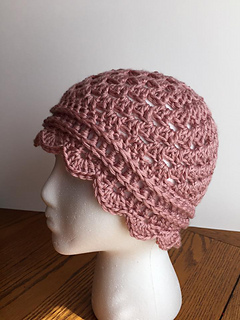 I wanted to make something special for a friend of a friend who has been going through a rough time and now recently has been diagnosed with cancer, so it was important to me that a hat for her be something special. I wanted delicate, feminine, soft, able to be worn with a dressy outfit, but equally suitable with jeans and a t-shirt. 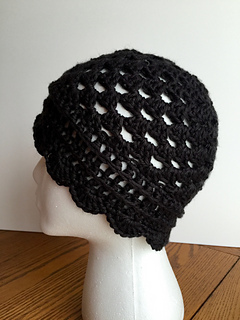 Something that would keep her head warm, but breathable and open enough to wear even in the summer months. She’s British and so I ended up looking online for inspiration and thought something “Downton Abbey-ish” would be perfect. I tried several patterns and just couldn’t seem to find exactly what I wanted. Ultimately I decided to create my own pattern and this is what I came up with. 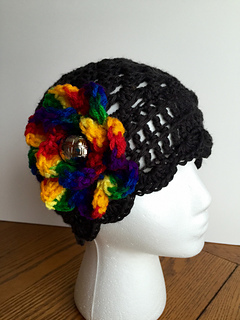 I used Caron Simply Soft in creating mine, but any soft lightweight worsted would work equally well I’m sure. 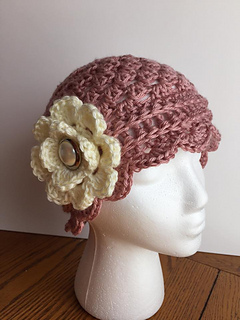 Please be certain to read the notes section regarding gauge to get a good fit as ideally this is a fitted, but not overly snug hat, though I am working on a slouchy version (as well as a matching scarf and maybe gloves too!) to compliment what I’ve made here. Please enjoy and feel free to message me with any questions or concerns as I’m always happy to help. Many thanks!